XVII-XVIII • This Armenian hymnal with khaz notation was created in the late-seventeenth or early eighteenth century. Although no colophons are recorded in the manuscript, the name of the scribe, Awēt, appears on fol. 11r. This may be the same Awēt whose work is recorded elsewhere in manuscripts produced at the Monastery of Surb Amenap'rkič in New Julfa, Isfahan (Iran). 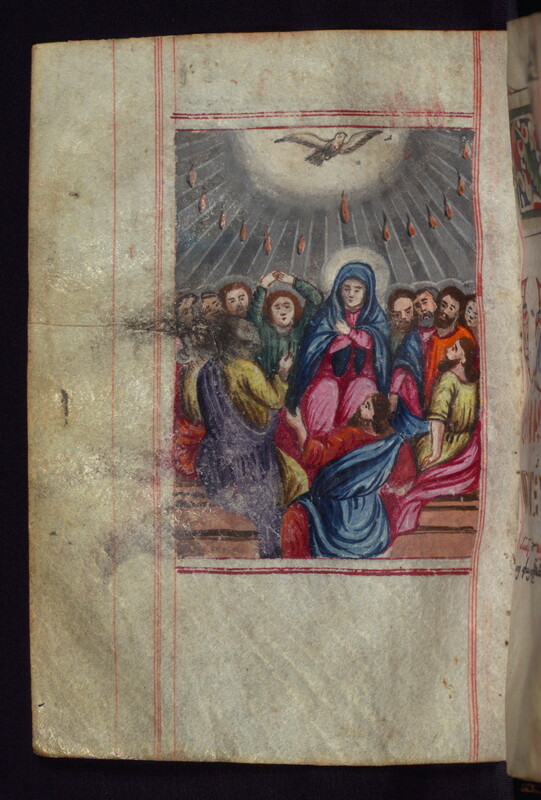 The four miniatures depicting Joachim and Anna, Adam and Eve, the Resurrection of Christ, and Pentecost represent familiarity with European pictorial traditions. They appear to have been retouched after the original paint began to flake off. 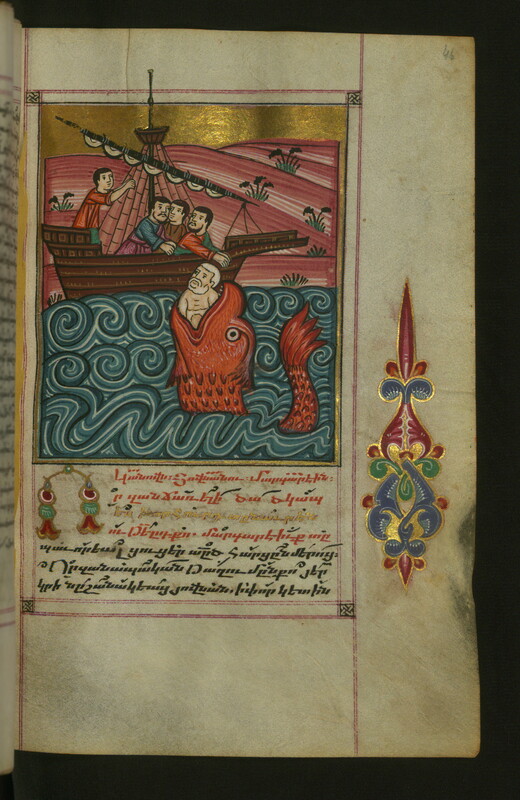 The head-pieces for canon divisions and the marginal decoration are based on earlier Armenian models. 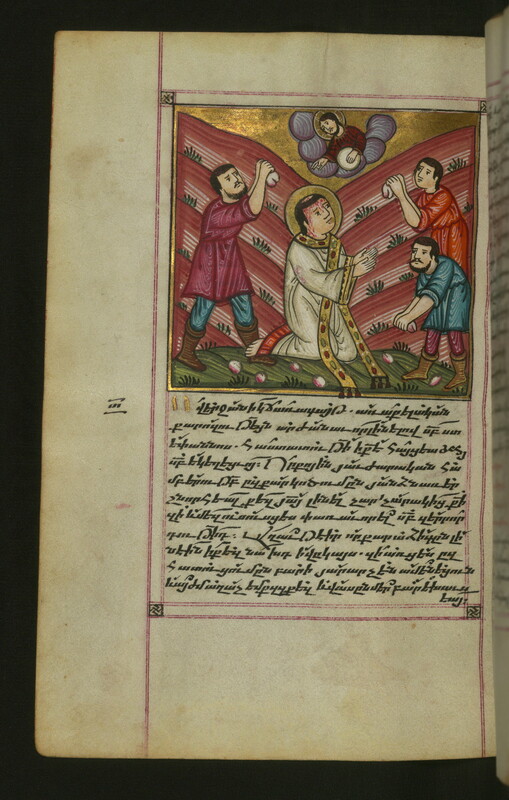 The small size of this hymnal suggests that it was used privately when participating in the Armenian liturgy. Produced in the late seventeenth or eighteenth century, possibly at the Monastery of Surb Amenap'rkič in New Julfa, Isfahan, Iran, by the scribe Awēt (or Awetis). 1687 • This hymnal with modal signatures and khaz notation was completed in Constantinople on August 15, 1678 [AE 1127], by the priest Yakob Pēligratc‘i, having been commissioned by Člav, son of Nawasard, as a dedication to his sons, Astuacatur and Sahak. 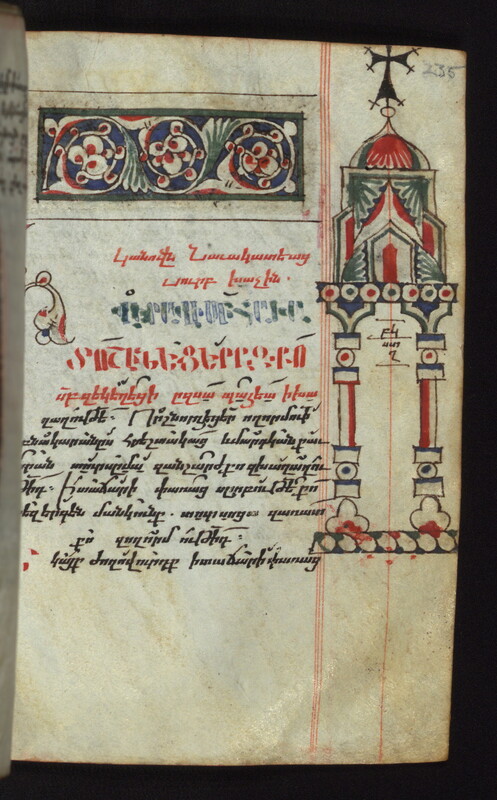 The structure of the hymns adheres approximately to the standard Armenian hymnal (Շաբակնոց), with minor variations in order and a few substitutions (see Sanjian in the bibliography). The book is illuminated extensively, with thirty-eight full- and half-page polychrome miniatures against gold backgrounds, eight decorated head-pieces marking the principal divisions of the hymnal, and numerous marginal miniatures marking individual hymns, including biblical figures, saints, bishops, and vignettes. 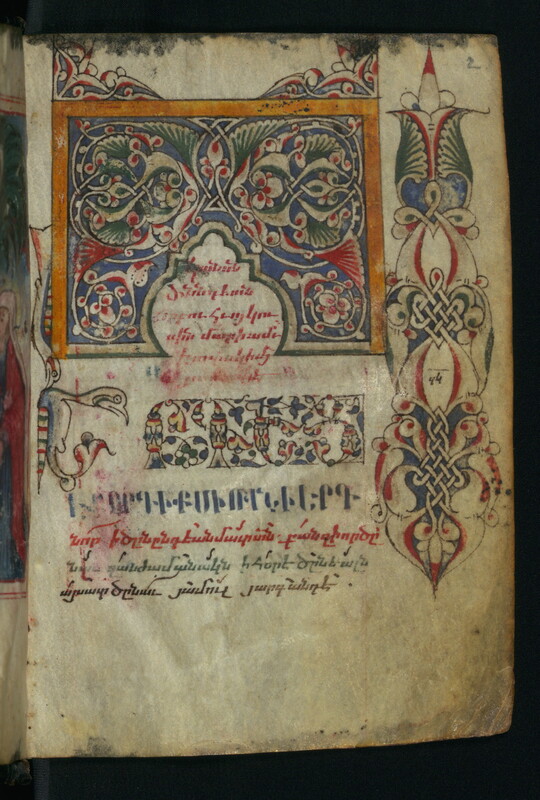 The style of the miniatures is largely in imitation of western European models, though more traditional Armenian and Byzantine influences stand out, such as the vibrant color palette, an iconic frontality for depictions of saints and bishops, and the highly abstracted floral motifs and zoomorphic incipits marking hymn divisions. The city of Shosh (Isfahan), which was [word(s) missing?] The King Shah Sulayman (lit: Sēlimn), in the time of the year 1127 ( = 1678). 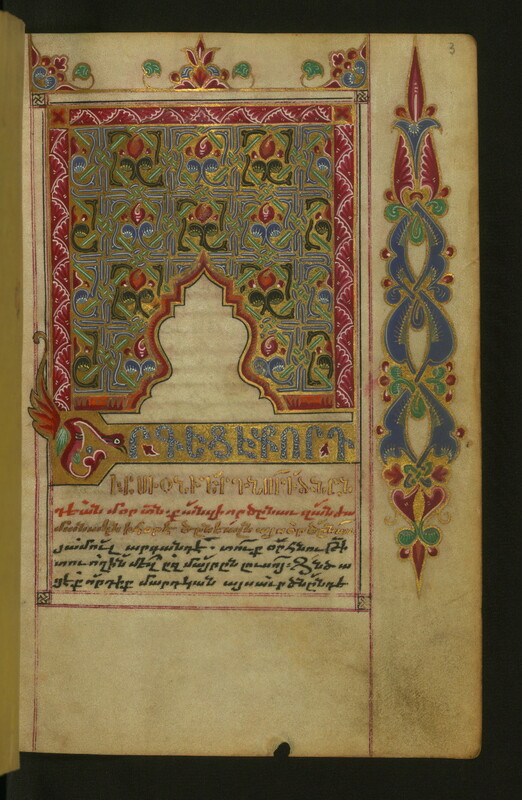 This Hymnal is from the region of Ghap‘an from the village of Mughanchugh (Mughanjigh), from Chlav the son of Nawasard of Shŕnughi (Shuŕnukhi) and his sons. Փառք ամենասուրբ երրորդութեան հօր և որդւոյ և հոգւոյն սրբոյ, այժմ և միշտ և յաւիտեանս յաւիտենից, ամէն: Աստուածաւանդ սուրբ շարակնոցս գրեցաւ ի խնդրոյ աստուածապաշտ Նուասարդի որդի Ճլավս, ի վայելումն որդոցն, և ետ երկուցունց յիշատակ Աստուածատուրին, և միւս որդոյն (Ս)ահակին, և սա գրեցաւ ձեռամբ Պէլիգրատցի Յակոբ երէցվէ ի մայրաքաղաքն Կոստանդինուպօլի, ի թվականիս Հայոց ռ՟ճ՟ի՟է՟ (= 1678) օգոստոս ամսոյ ժ՟ե՟ (15) պատկերաւրն զ՟շ՟ի ի հայրապետութեան Հայոց տեառն Յակոբայ, և առաջնորդ [SDN 92] սուրբ Երուսաղեմայ Մարտիրոս վարդապետ Կաֆհայեցոյ, և ի պատրիարգութեան Կոստանդինուպօլի տէր Անդրէաս քահանայի, որ մականուամբ Ճիհանլամ մարտիվանի ասեն, որ է դժոխաց սանդուխտ: Եւ ի թագաւորութեան Ոսմանց, սուլթան Մահմատ, ասեն որ ի (20) տարի եկաց ի Անդրիանուպօլի, յետ այս տարովս ռ՟ճ՟ի՟զ՟ (= 1677) Ապրիլի բ՟ (2) օրն, երկուշաբտի մտաւ Իսլամպօլ ինքն և մայրն: Յիշատակ է որդոցն Աստուածատուրին, Սահակին, և ես Նաւասարդի որդի Ճլավս որ եմ ի գեղջէն Շռնըղու, ով ոք յիշէ սրտի մտօք յիշատակօղսդ և ինքն օրհնեալ է և եղիցի յամէնից, ամէն: Հայր մեր որ յերկինս, սուրբ եղիցի անուն քո: Այս է շարակնոցս Մոսէսի, Մոսէսի որդի Ոհանջայ թվս. ռ՟ճ՟կ՟ ումն (= 1711) Հուլիսի ժ՟ ումն (10). Glory to the most holy Trinity, the Father, and the Son and the Holy Spirit, now and ever and in all eternity, amen. 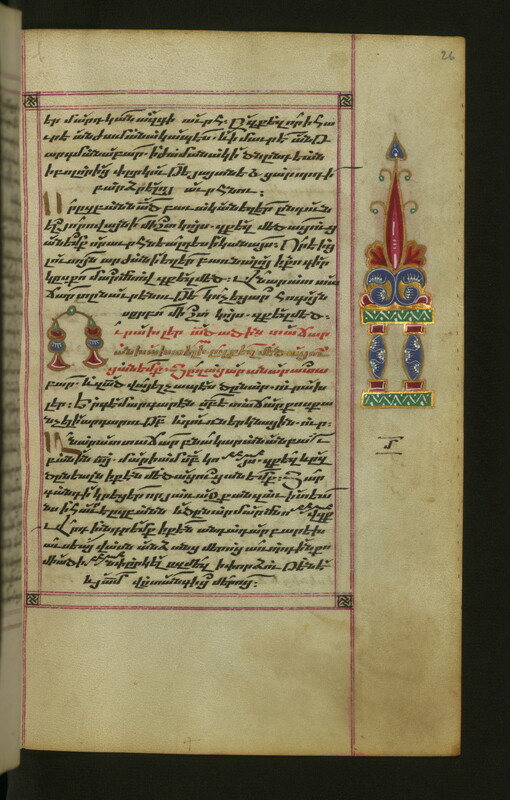 This holy Hymnal confessing God was written on the request of the pious Chlav son of Nawasard, for the enjoyment of his sons, and he gave it to both in memory of Astuacatur, and his other son (S)ahak, and this was written by Yakob the priest from Pēligrat (Bely Grad? ), in the capital Constantinople, in the year of the Armenians 1127 (= 1678) in the month August, on the 15th, [two words unclear] during the patriarchate over the Armenians of Lord Yakob and the leader(ship) over holy Jerusalem of Martiros vardapet from Kaffa, and during the patriarchate over Constantinople of Lord Andreas the priest, who is called by his nickname Chihanlam Martivani, which is the Ladder of Hell. And in the reign over the Ottomans of Sultan Mehmed, they say that he came into A[n]drianople at twenty years, after this year 1126 (= 1667), on the second day of April, on Monday he and his mother entered into Islampol. This is in remembrance of (my) sons Astuacatur and Sahak, and I Chlav, Nawasard’s son, who am from the village of Shŕnĕghi (Shuŕnukhi), whoever remembers with the thoughts of his heart those who (are) remember(ed), he himself also is blessed and will be by all, amen. Our Father who art in heaven, hallowed be thy name.